"On the charming ile St Louis, Auberge de la Reine Blanche welcomes you in a most unusual setting with a period decor made up of antique furniture, copper pots and dolls. Enjoy traditional cuisine prepared with fresh products from the market. Ravioli of Royan with mushrooms and herbs or the duck breast with sauce with honey and spices give you an overview of the exquisite preparations of the chef! Here's an establishment whose fine cuisine, friendly service and genuine atmosphere will seduce you from the very start. A restaurant that works with complete menu options at low prices: a location to discover and publicize!" I've been coming to Auberge de la Reine Blanche since 2005. I always bring friends and colleagues and I'm never disappointed. Another delicious meal, and a magret de canard that I've loved for 14 years. Merci mille fois! A bientôt! We enjoyed your company too. Thanks for coming, and please come to eat in our restaurant again ! A great meal, unhurried. Oysters with country ham as a starter and a simple, but delicious chicken with mustard for the main course. We are glad you enjoyed your dinner in our restaurant. Thanks ! Lovely, traditional French restaurant. Warm atmosphere. Great food. It was a pleasure serving you. Please come back again to see us ! I've always enjoyed the Augerge de la Reine Blanche. 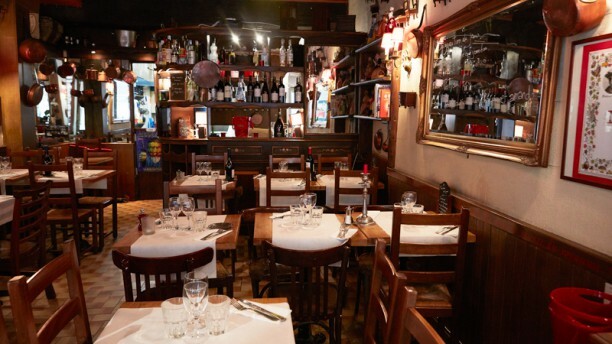 Mostly traditional French food, but daily specials as well. I especially like the 39 Euro menu -- an apero (Kir), entree, plat, dessert, and pichet of wine. Certainly recommended. Our family of four enjoyed a great dinner that included all the French classics. Sauces were delicious. Vegetables were perfect. Duck was a little tougher than we like, but beef bourgignon was outstanding. Service was very friendly and helpful, which is much appreciated as a tourist. It's a small cozy space that made our dinner and conversation very pleasant. What a wonderful evening in a beautiful little restaurant with a welcoming host and a truly delicious dinner! We will be back! I've been here several times while visiting Paris on business. The food is always great. What a lovely, classically Parisien meal! It was the best beef bourguignon I have ever had. The service was fun (and, yes, our hostess did have to leave the restaurant fetch the wine when we ordered but we found that amusing! ), the atmosphere delightfully cosy and the food really delicious. Located on the Ille Saint Louis behind Notre Dame, the Auberge de la Reine Blanch is situated on a street loaded with restaurants and shops. I, my wife and daughter arrived a little after 19:00 (our apologizes since our reservation was at 19:00) but this is quite early for French dining so we didn't have a problem with seating and the beautiful hostess made us feel welcomed immediately. We ordered a fine bottle of red Beaujolais wine with escargot and oysters for starters. My wife had a goat cheese wrapped in ham with a small salad. These were all quite delicious. The main course was entrecote and beef bourguignon and these too were extremely tasty. This was topped off with a delicious dessert which was included in the Menu and the price was exceptional for the quality, service and cozy atmosphere. If you want to have a good hearty and delicious meal, I would highly recommend Auberge de la Reine Blanche. Nice Little restaurant. The creme brulee was not brulee enough but except that it was ok. The food and service were beyond belief.